When it comes to dimensional work nothing beatsStudio High Viscosity acrylic paint, with its thick consistency and satin finish, it retains brush or spatula marks. 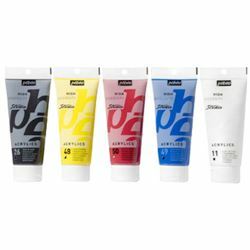 Studio Fluid Acrylic, which is fluid with a satin finish, is suitable for detailed work. Applied with a brush, it can be used for fine, regular lines, glaze effects and watercolour effects. It is guaranteed free of environmentally harmful heavy metals.